That 189 is seriously odd. I could see it if it went directly to Keele (and that makes more sense than an extension of 127 Davenport), but why the jog from Keele/Bloor to High Park? Steve: Sean Marshall has already suggested that it may be because all of the bays at Keele are spoken for. Wow, this really isn’t that bad. And I wasn’t expecting to say that after the original proposals. I’m moving to the Junction next month and I think these changes will actually really help me. One thought: why not run just one through branch of the 40, and then have the 30 (maybe renamed 30 High Park?) loop either via Dundas and St. Clair in place of the proposed 40B, or even run both ways via Dundas, Jane, St. Clair up to Gunns Loop? It’s just a thought on my end. I do wonder what route(s) will see a few buses moved off it for these improvements, but hey credit where credit’s due. Good job on this one, TTC. What is the point of running the 189 from High Park Station to Keele? Is this due to lack of empty platform space at Keele Station? The 189 route makes no sense. I mean I’ll assume it makes no stops from High Park to Keele along Bloor St. Another flaw with this route is the bus turning onto West Toronto St rather than just go up to St Clair then turn. West Toronto is congested and this route would be delayed. Steve: I believe that the purpose is to avoid the intersection of Keele & St. Clair which, of course, everyone else is trying to do too. Keele Station is crowded now and the traffic between Annette and St.Clair is heavy much of the time. 189 will never maintain its schedule just like 71A can’t now. Poor choice. 1. Keele Station needs to have it bus platform expanded. There is still a gasoline station since before the station opened. Maybe even extending the 506 CARLTON streetcar into an expanded Keele Station (think double-ended streetcars)? 2. 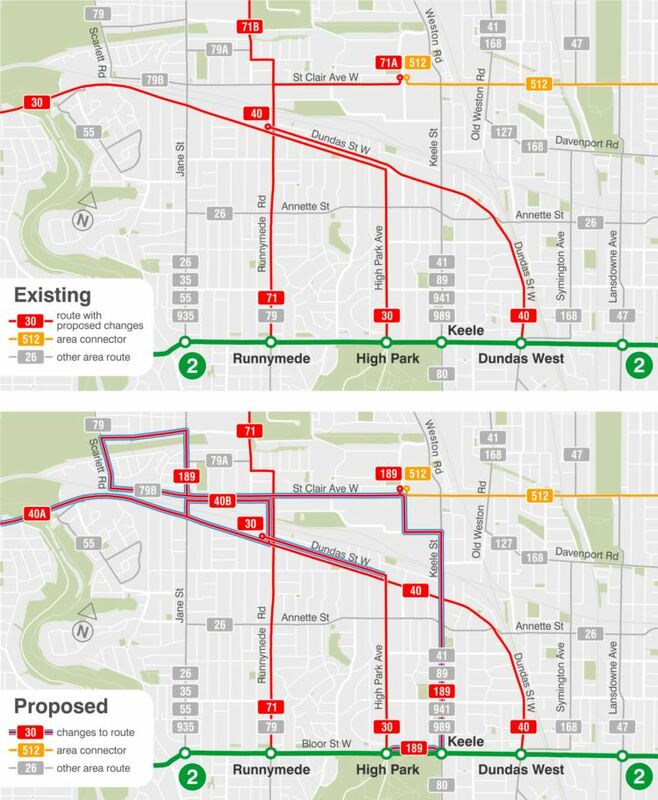 The proposed 30 HIGH PARK bus ends at the (Dundas &) Runnymede Loop. Should be extended and merged with the 55 WARREN PARK bus to serve the on-street looping off Old Dundas Street. Steve: 55 Warren Park needs to terminate at an accessible station, and High Park isn’t yet. 3. Maybe if they don’t expand the Keele Station, they’ll extend the 512 ST. CLAIR streetcar to Scarlett Road instead, after the Scarlett Road railway underpass is widened and improved? Steve: The idea of extending the 512 further west only had traction when there was going to be a TTC-gauge Jane LRT by which the St. Clair cars could reach the new Finch West carhouse. The streetcar will never go west of Gunn’s Loop. Last Monday some “info” staff were set up in Keele station with maps and other information material, so they do seem motivated to do this, and correctly too. I wrote this into TTC too. But sharing with you and everyone who reads this my thoughts. 1. They won’t get away with the 189 servicing Keele Station on the street. There’s no entrance on the west side of Keele to the station. Have it drop off then have layovers at High Park Station. The route will be late enough going on West Toronto and Old Stockyards anyhow. 2. Do not support the three buses on Dundas between High Park and Runnymede. 30 should loop at 40B routing via Jane and Dundas. 3. Do not support Old Stockyards and West Toronto diversion. Should be Weston-Gunn’s diversion instead but it won’t be able to go into Gunn’s loop as the Map shows it does. With all this talk about the 189 going to High Park Station instead of ending it at Keele something tells me that the revised route 30 will interline with the 189. If so then I do see the 189 routing working. Or maybe eliminating the 30 all together and have 189 run north on High Park to Dundas then to Keele to route. Whatever happened to the idea of extending 512 to Runnymede loop or Jane for that matter. The area has changed in the last 15 years. Gunns loop can barely fit two Flexicities. The old railway spur crossing St. Clair is gone. Any thoughts Steve? This should be a cheap cost to extend 512. Steve: This idea only had legs when the Jane LRT would have provided a TTC gauge link to one of the new Transit City carhouses. As it stands, the Jane LRT is unlikely to ever be built, and even if it is, it would be standard gauge. The 512 will run out of Hillcrest long before that. If the TTC keeps padding the schedules on St. Clair, they might have to extend the line west and build a new loop just for the purposes of having enough track to hold 4+ Flexity cars. I would keep the 30 and 40 on their current routes. Again why keep change routes and numbers like they have for the last four to five years. Personally, this is just making the bus system more confusing to use. I am so upset about the proposed changes to the route 30 bus – leave it alone it is working great and is the only means for anyone living along our stretch of Dundas to get to a subway station (East of Royal York and West of Jane – there is a huge long stretch with no north south buses due to the Humber ravine). If you change it to the 40 going to Dundas West station, it’s going to make our morning commute to the subway so much worse due to bumper to bumper traffic along Dundas as you approach Keele. It’s not right to only aim at improving the Junction transit by making service worse for your neighbours to the West who also live along Dundas and use the #30 bus.